Hello, I went through the discussions and didn't find a solution, hopefully this is not double-posting. I started from scratch, drew the picture, put in deformers in the modeller and finally made the animations. Up to this point everything worked fine. The arm animation you see in the gif was a bit tricky at first. In the end I made 2 separate arm layers so I can have a different hand and move the left arm behind the skirt. I just switched the visibility in the Animator. I've put this animation in a scene and exported it as a MTN file. I included the Switch Part View. But when I open the MOC file in the viewer, both sets of arms are visible all the time. The rest of the animation works. So I was hoping somebody can help me with that. Thanks a bunch in advance ^^ - if anyone needs more information, ask away! Also if necessary I can upload all the files I'm using. thanks for your interest in Live2D! Cool that you did everything from scratch. It would be great if you could send over the .cmox and the .canx to check them out here. It might have something to do with the viewer itself but it also might have something to do with the way you exported the animations. 1) Open the model in the viewer. 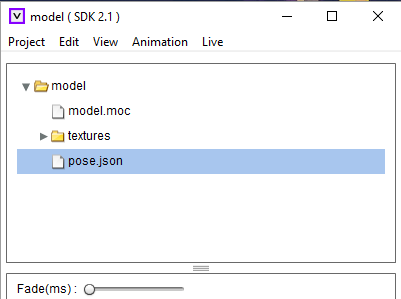 2) Add a pose file to the model. 3) Select the pose file in the list view. 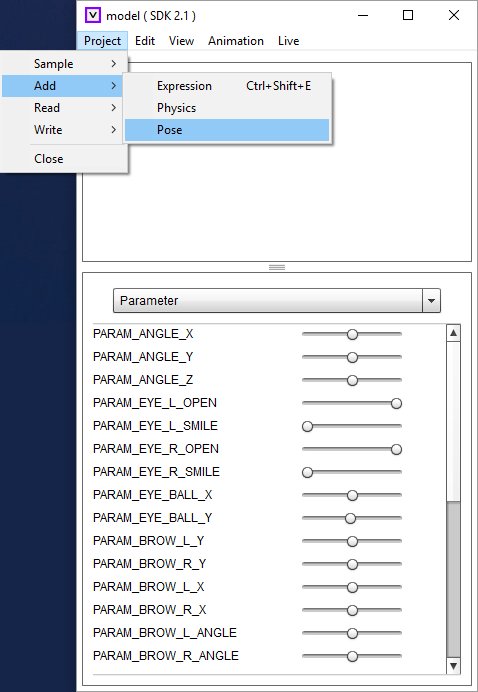 4) Set the "Fade(ms)" within the pose dialog to 0.0. (You can try other values, too, of course). 5) In the same dialog, group the parts that are to be switched between together by giving them the same number. 6) Try out your animations. Hope this explanation helps to achieve what you want.